Abraham. Billy. Cristo. Sukey. Violete. Young Sam. Zachariah. These are just a few of the people who helped build and sustain the University of Virginia in its early decades. Most of these laborers were only noted by their first names because they were enslaved. Euphemistically called “servants” in University records, the names of thousands more have been lost to the dark side of history. They will be remembered, with and without names or details, thanks to the diligence of the President’s Commission on Slavery and the University, convened in 2013 by President Teresa A. Sullivan. They will join the stories of other African-Americans uncovered in UVA’s 19th-century history, including Henry Martin, William and Isabella Gibbons, and Peyton Skipwith, all enslaved laborers who are now honored by plaques or buildings named after them around Grounds. Over five years, the commission has conducted archival research, created educational opportunities for students and the public, and commemorated people and places where possible. As the commission wraps up its work investigating the legacies of slavery in the building and early operations of the University, it leaves a list of accomplishments and recommendations that have shed new light on the past and will forever change Thomas Jefferson’s Academical Village. The commission’s work drew on the efforts of hundreds of people. The original group comprised about two dozen members, led by co-chairs Dr. Marcus L. Martin, UVA’s vice president and chief officer for diversity and equity, and Kirt von Daacke, assistant dean and professor of history, and including representatives from across the University and from community organizations. One hallmark of the commission’s operation was enlisting students each year to assist in some of the projects. 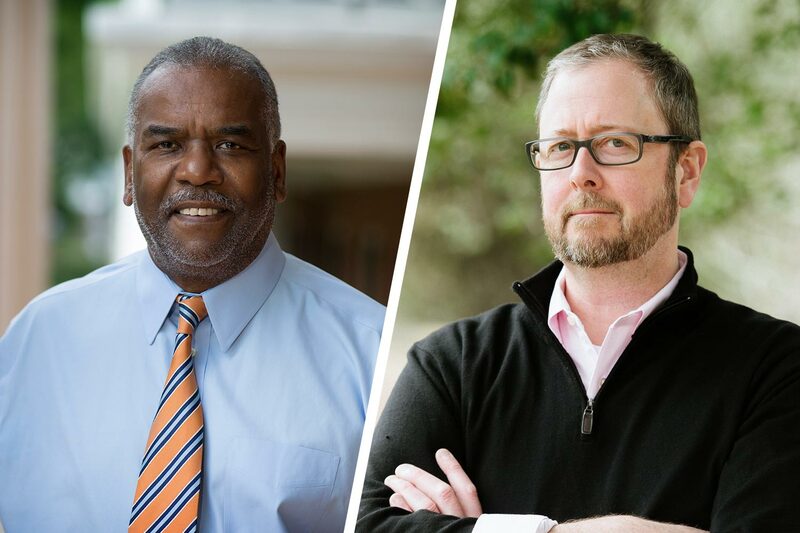 Local and national advisory boards, plus a community relations task force, brought in dozens more people to discuss and review the efforts to “explore and report on UVA’s historical relationship with slavery, highlighting opportunities for recognition and commemoration,” as Sullivan’s original charge stated. A final report, available online, describes the commission’s work and includes almost 40 pages detailing the African-American presence and community in and around the University, both pre-Emancipation and into the early 20th century. Other sections describe the range of initiatives the commission undertook – new educational opportunities, community involvement, dedicated events and ideas for future research and commemoration. “It has been an honor and distinct privilege to serve as co-chair of the President’s Commission on Slavery and the University,” Martin said, “with Kirt von Daacke, Meghan Faulkner and all members of the PCSU, PCSU National Advisory Board, the PCSU Local Advisory Board, the PCSU Community Relations Task Force, many students, faculty, staff, alumni, community members and the Office for Diversity and Equity team. “Members of the PCSU, advisory boards and task forces have done an extraordinary job researching the history, telling the story and educating others, completing numerous initiatives and providing recommendations for further study and repair,” Martin wrote in an email. Von Daacke concurred, saying, “I’m honored to have led a dedicated team who worked tirelessly for five years to bring back into public view the lives and labor of the thousands of enslaved people who built and maintained the University for nearly 50 years. One of the slavery commission’s most tangible outcomes is the planned Memorial to Enslaved Laborers, the design of which includes a circular stone ring etched with as many names as can be recovered. Since the University’s Board of Visitors approval last June, fundraising efforts have been underway and the project is currently in the bidding phase. Eto Otitigbe, a polymedia artist who creates sculpture, installation and public interventions, has joined the design team. The project is slated to begin this fall on the triangle of grass east of Brooks Hall and across the street from the Corner. “Our decision to create a memorial to enslaved workers is an expression of our shared commitment to tell the full story of the University’s past, as we look toward its future,” Sullivan said at a bicentennial event in October. In the process of developing the design of the memorial, the design team solicited views and ideas from the University and local community, one of many public outreach efforts. The consortium holds semiannual conferences to share information and ongoing efforts at the various institutions. UVA, partnering with The Slave Dwelling Project, hosted last year’s fall conference, “Universities, Slavery, Public Memory, and the Built Landscape,” coinciding with the University’s bicentennial programs last fall. Another part of the commission’s charge included projects that would “educate students, faculty, staff and visitors about enslaved individuals who worked on Grounds,” which the commission not only proposed, but brought to fruition. In addition to making an Enslaved African Americans at UVA Walking Tour map available, new exhibits providing information about slavery at UVA have been added in the renovated Rotunda Visitors Center. Several courses have been created to give each class of undergraduates the opportunity to learn about this history and participate in ongoing research: “Slavery and Its Legacies” is a team-taught course for first- and second-year students, offered yearly in the fall; a more focused upper-division Pavilion Seminar allows students to do their own research; and a weeklong summer program, the Cornerstone Summer Institute, draws high school students to the Grounds “to engage in historical investigation, archaeological excavation and community engagement in order to learn and develop thinking skills that will prepare them for success in college and beyond,” according to the report. Students in the spring Pavilion Seminar will contribute to a new venture: an online encyclopedia called “NewUVApedia,” being developed to preserve and make public their research, which should go live in the coming months, von Daacke said. The list of the commission’s accomplishments also includes the preserved African-American cemetery, found adjacent to the University Cemetery, complete with interpretive signs; the naming of new buildings, including Gibbons Hall, a dormitory, and Facilities Management’s Skipwith Hall; and a forthcoming book. These initiatives and the planned memorial “have begun to tell a fuller story about the University’s past that honors the contributions of the enslaved,” von Daacke said. The commission’s final report calls for continuing institutional efforts such as Universities Studying Slavery, preserving other spaces known to be slave sites on Grounds and providing educational interpretation, expanding African-American scholarship programs and creating research endowments. As the slavery commission wrapped up its work, Sullivan established a new complementary group to continue this serious investigation into the University’s history. Von Daacke will co-lead the President’s Commission on the University in the Age of Segregation with Andrea Douglas, a UVA alumna and executive director of the Jefferson School African American Heritage Center in Charlottesville.